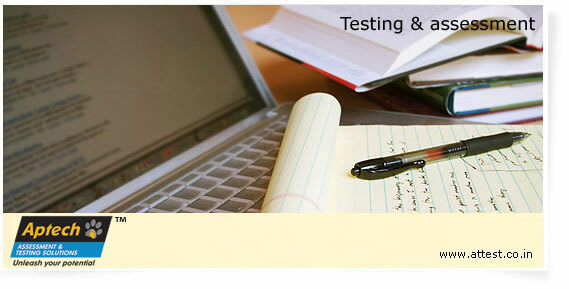 Aptech Assessment & Testing Solutions is the assessment solutions arm of Aptech Limited. Aptech Assessment & Testing Solutions conducts proctored (invigilated), online & paper-pencil testing for universities & corporates. These tests could be entrance exams or semester-end tests for distance learning & regular universities or for recruitment or promotion in corporates. Aptech Assessment & Testing Solutions is the market leader in this segment, having conducted millions of tests till date & with a distinguished list of corporate & university customers. Tests conform to BS7799/ ISO 27001 security standards with security maintained at every stage & every client concern addressed. Tests are delivered through a network of testing centres in India & abroad. Examinations under video surveillance, mobile testing centres, backup power & backup Internet connectivity are offered.